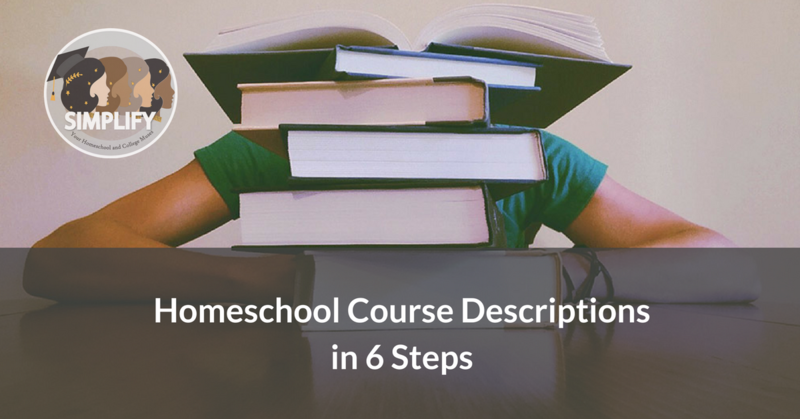 Course descriptions are simply, exactly that: a document that lists and describes all the courses your homeschooled high schooler took (or will take) from 9th to 12th grade. They give admissions committees very helpful insight into your child’s homeschool journey and academic preparation for college. Find out what you really need to know about preparing this time-consuming but valuable* counselor document. Step 1: Will you even need them? Homeschoolers often have to jump through additional hoops during college applications. Always check college websites for what they look for in homeschooled applicants. Many college websites now feature homeschool-specific information. If they don’t (or even if they do) we always suggest contacting the colleges for details. Unless the college vehemently insists that you don’t send them, or unless the college is like the University of California schools who don’t ask for any counselor documents until your student is accepted, submit course descriptions anyway. Many application portals will have a dedicated space for uploading the document. Some schools might ask that you mail or email the document directly to an admissions officer. We recommend drafting your homeschooler’s course descriptions starting in 9th grade or the year that you first start homeschooling high school, whichever is earlier. My young teen isn’t even thinking about college, you say? Write it anyway. If you wait to write them only in senior year, you risk adding to your and your senior’s already very full plate during applications season. Not only that, you could have also forgotten a lot of the work you accomplished together in the earlier high school years. Don’t let it worry you too much. The trick is to start writing them for just a few minutes at a time. Once you have a draft, you can spend the summer of junior year editing and polishing details. Step 3: It begins with your computer. Open your trusty word processing software. Give it a title (Course Descriptions for Your Child’s Name). Voila! Depending on how you homeschool–by semester, quarter, trimester, or by year–write the courses that your high schooler completed. Save the document in an easily accessible folder. Step 4: What do I write? List all the subjects your student learned in high school. For many homeschoolers, these would be English, Mathematics, Science, Social Studies, Foreign Languages, and Electives (choose your preferred order with languages and electives usually going last). Organize yearly classes under each subject title. Some homeschoolers choose to categorize descriptions under high school years instead of subjects. There’s no hard and fast rule. Simply follow the same example as your homeschool transcript for easy reference. Choose a descriptive course title. English 9 is completely fine but it does not describe the absolutely amazing medieval literature study your freshman might have completed. Call it Intro to Medieval Literature and you have saved the admissions committee precious time! You can edit the name later, before you submit it through the application portal. List key and supplementary resources (textbooks, novels, reference books, videos, etc.) used. List topics/content covered. If outsourced, you can copy and paste the provider’s description (with edits if needed). Or type out and summarize the textbook’s table of contents. Include the class provider’s name if the course was outsourced. If it was a self-created class, you can call it homeschooled or independent study. Include grade received and how many credits the course is worth (if dual-enrolled in a college class, include college credit hours too). Include any other relevant notes but keep them brief. If you are writing these descriptions for your senior, include courses in progress as well as courses planned for the spring (if you know what they are). In junior or senior year, include the finalized grading scale, and if you like, an annotated list of books/materials your child read in their free time or used in addition to assigned resources (just choose the best ones). This gives the admission committee some insight into your homeschooler’s love of learning! Any document is only helpful if it is clear, readable and well-organized. Use easy-to-read font. Arial, Calibri, Helvetica, Times New Roman are all common choices. Size 11 or 12 might be best. Some descriptions will be longer than others; just go with the flow! Use generous line spacing. Too much text on a page will sap the reader’s interest. Save the document every time you make content and format edits. Once you have checked carefully, upload the document in Adobe pdf format to the Common Application portal. Course descriptions can range anywhere from 1-40 pages. We suggest brevity and common sense. Step 6: Ask friends for samples. Text: Geometry by Ray C. Jurgensen, Richard G. Brown, and John W. Jurgensen (Houghton Mifflin, 1997). ISBN: 039577120X. Topics: Euclidean geometry including definitions, postulates, theorems, angles, parallel lines, congruent and similar triangles, polygons, circles and arcs, and area and volume. Note: In addition to standard homework load, the student was assigned the most difficult, proof-based, problem sets. Topics: Introduction to the elements of short fiction, critical approaches and critical theory about short fiction. Close reading and advanced composition skills. We know that this is a lot of information but if you start early, you have time to make as many edits as you need. The trick really is to space out the effort so that you won’t feel burned out. See our School Profile how-to here. Next StoryHomeschooling The Early Years – Relax and Enjoy!